Would be nice if you could post what's in the latest version of beta/prerelease to give us a heads-up on what to expect? I'm running a modified comskip.ini and have to keep checking each beta to see if the default changed to update my override copy in the data directory. In order to see what changed I have to rename my override comskip.ini and run comskip to get a copy of the new default ini file in the logs directory to see if it has changed. After doing this, does one still need to 'SHIFT' click on check for updates, or will a non-SHIFT'd check for updates grab the latest beta? No clicking required if you use the curl command. We don't publish changelogs for beta builds as many things are being tested rapidly and it's not feasible to write accurate notes. As far as comskip we don't anticipate any more changes, and as mentioned earlier we will likely be removing comskip in the future. Does that mean it will automatically install the latest beta/prerelease without having to click or shift-click check for updates? So pardon my ignorance, or maybe I didn't phrase the question right. Does this put me on auto-pilot where it downloads the latest beta when available automatically, or is it a per instance that when I run the command it will check for the latest beta version like doing a SHIFT-CLICK check for the latest beta version? "Does that mean it will automatically install the latest beta/prerelease without having to click or shift-click check for updates? So yes it will automatically update without clicking. "whenever you run that command it updates to the latest beta available. It's the same as SHIFT-click"
But maybe only each time when you run the command, not automatically when a new version is available...? 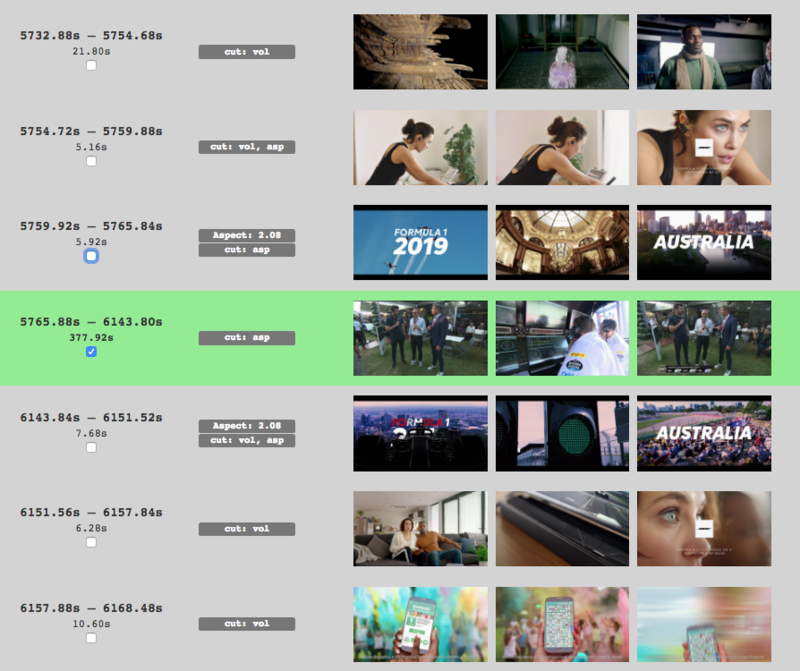 I'm torn between wanting bigger thumbnails when editing commercials, and not wanting to see spoilers. I went through and edited a few recordings. The process was really simple. I did run into problems where I sometimes had trouble telling what was a commercial and what wasn't, But that's a me problem. Seeing some recordings where comm segments are totally missed and appear as part of the show, which is better than missing show segments. Comskip doesn't catch the beginning of the comm segments since the show and comm segments don't have any reliable demarcation point where the last show segment frame ends and the first comm segment frame begins, being back-back frames with no reference frames/black frames/audio transition between. Haven't dug into cc data, but some of these transitions must be hard to detect. I'd rather skip through these than miss a show segment mis-identified as a comm break. We watched our first show with autoskip on after I had tweaked the commercial breaks. That got an "impressive" from the spouse. It helps that we had just come from watching a show on Plex where we had to do 10 second jumps through the commercial breaks. 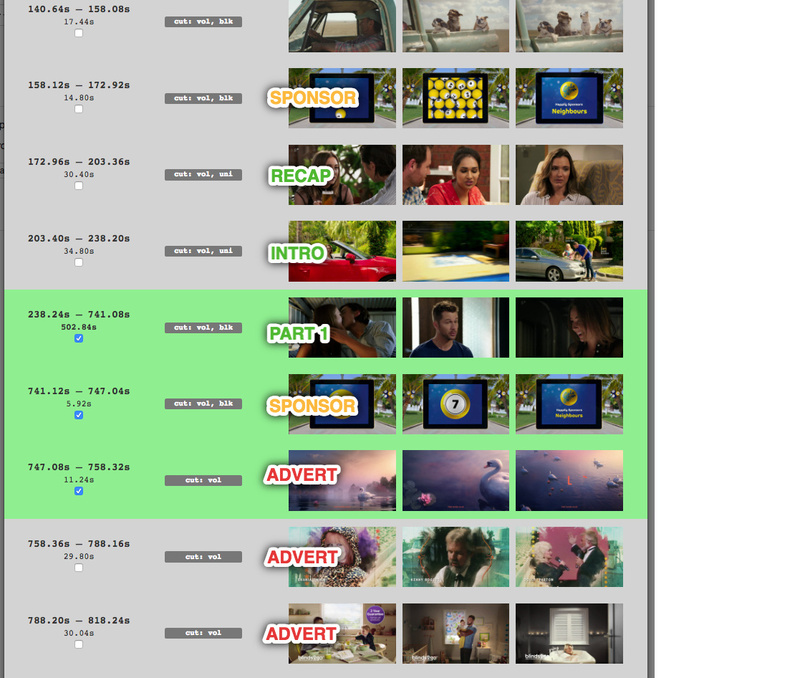 Commercial detection struggled a bit with the Formual 1 Highlights on Channel 4 (UK), recorded on Sunday. It seemed to correctly detect each break, but would often skip too early. There is a 4 second "sponsored by Bose" ad immediately before and after each break, but it would ofter cut off footage from the show which immedialy preceeded or succeeded this. e.g. It autoskipped the Bose ad and the Intro sequence, starting at the feature video. Then, after the first break, it then missed off about 4 seconds of the "Australia" intro clip (which came after the Bose clip) (it also did this after each further break). New for this year, just before each break, before the Bose ad, are 10 second "teasers" of what's coming next (typographic images and a commentary clip to keep you guessing), these often tripped up the commercial detection, sometimes it would cut off a good 6 to 7 seconds of these making for quite a jarring transition. When it should wait until the Bose ad before skipping, especially when it always cuts off several seconds of the "intro" post-break clip too. 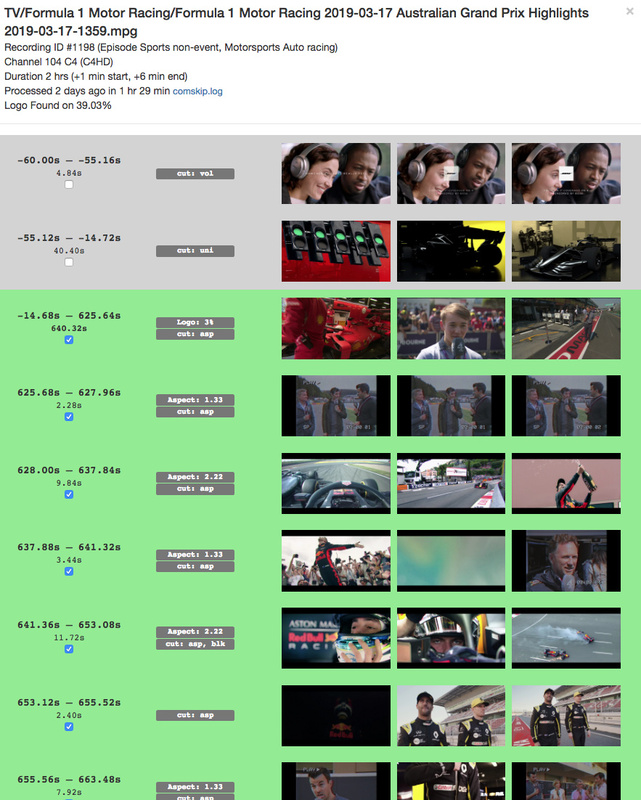 It also decided to skip the whole 60 second VT at the end of the show, which is a race recap shown as part of a music video. Also had issues with the day before's qualifying highlights, often not skipping until the middle of or after the first advert in a break, and often missing the intro video and first few words after a break. It seems that Channel 4 do not display their onscreen logo during F1 shows, so may this is why it's struggling? But if so, this could be a good reason for an "exclude this show from automatic ad skipping" setting. Maybe it's because this odd advert is always only 11 seconds long? Also note it misses the recap and show intro. Something interesting: We stopped watching a two hour program halfway through. When we picked up the next night, the first commercial break we came across didn't skip, even though it was marked. After that the commercial breaks skipped successfully. I feel like Comskip is still more tuned for the US style of ad breaks than for the UK. I wonder if it could be customised by country? 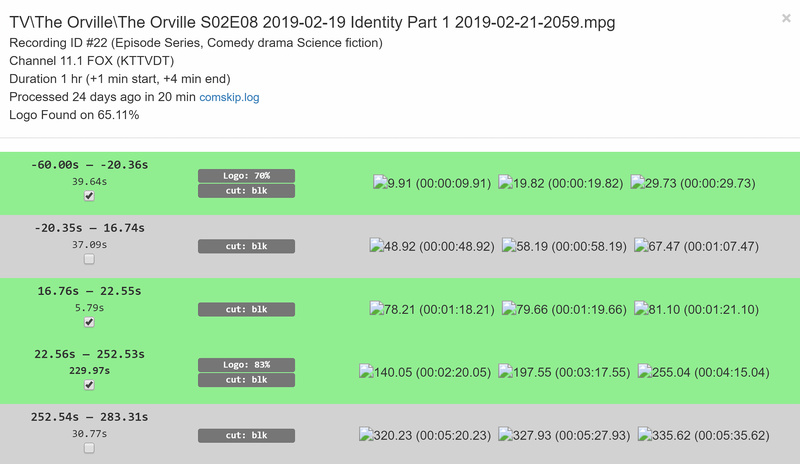 The best way to help us optimize ad detection in the UK is by using the commercial editor to mark recordings in your library. Once you have more than 50 recordings marked, PM me and I will provide instructions to upload the data to us so we can use it as we develop a better detector. Presumably I need to make sure the recordings don’t get deleted? Is there an easy way to get a total of the number of marked recordings? In the UK it would certainly be benifical to be able to disable commercial detection/skipping on a per channel basis. Most of the time it works great, but had another odd one yesteday, when watching the recording of The Great British Sewing Bee (BBC Two), despite there being no advert breaks at all in the hour long programme (as it's on the BBC), it randomly thought a short section (~60 seconds) in the middle of the show was a break and so suddenly skipped ahead. There was no obvious change in format. I'd like to be able to disable Commercial Skipping on BBC channels so I can be confident it doesn't accidently skip a section of the show. we will likely be removing comskip in the future.